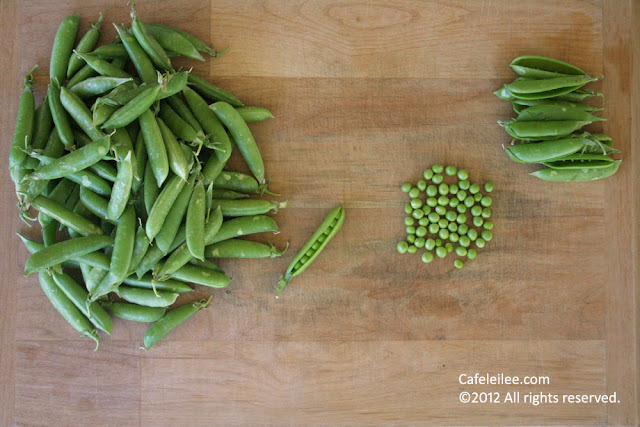 Before we say goodbye to Spring, I'd like to share a recipe made with one of Spring's best gifts to humanity, green peas. I've never been a big fan of peas, I never picked them out of my food, like I do so with eggplants! But, alone by themselves they're not something I crave for. 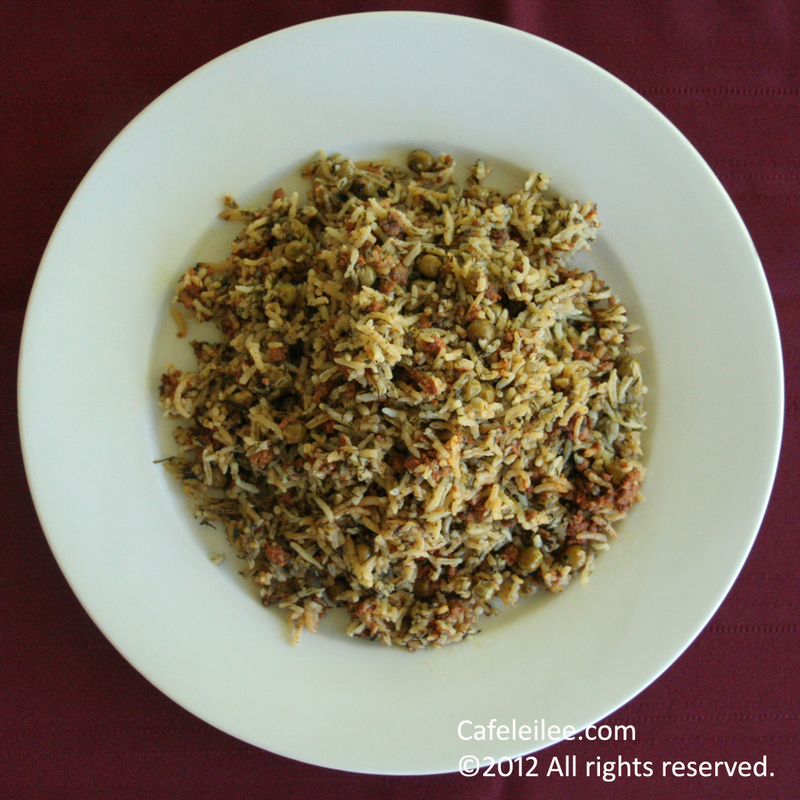 My favorite way of enjoying them is in this polow. 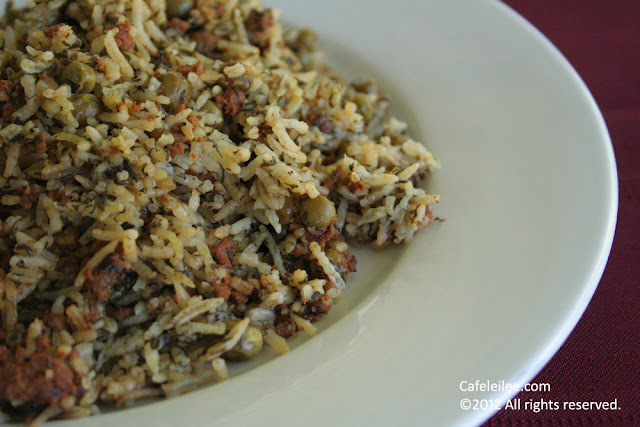 Mixed with dill and ground beef and layered with rice they become something out of this world. Place the rice in a large bowl and cover with water. Agitate gently with your hand and avoid breaking the rice grains, and then pour off the water. Repeat this 3 to 4 times until the rice is completely clean. Soak the rice with 6 cups of water and 4 teaspoons salt for 2 to 4 hours. In a large skillet brown the onions in canola oil over medium head. Add turmeric and ground beef and using the back of a wooden spoon break up the meat until brown. Mix in the green peas, tomato paste, salt and pepper, and water and bring the sauce to a boil. Then reduce the heat to low and cover. Let the sauce cook for about 15 minutes. In the meantime in a large pot bring 8 cups of water to a boil on high heat . Drain rice and gently pour into the boiling water. Bring water back to boil for 5-10 minutes. Test the rice to see if it's done. Rice grains should be soft on the outside and firm on the inside. Right before draining your rice add the chopped dills and mix quickly. Drain rice with dill and rinse with cool water. Clean out the pot and return to the stove, add 2-3 tablespoons oil to the pot over medium to high heat. With a spatula, place rice in the pot, layer it with meat and pea sauce, building it into a pyramid shape. Make 2-3 holes in the rice to let the steam out. Cook for about ten minutes or until the steam starts to come out, Add the butter and place a dish towel or 3 layers of paper towel over pot and firmly cover the pot with its lid and reduce the heat to medium-low. Cook for 40 minutes longer. Using spatula place rice on a serving platter without touching the crust. Mound rice in shape of a pyramid. Then remove the crust and place it on another dish and serve on side. قبل از اینکه با بهار خداحافظی کنیم، میخوام یک دستور با یکی از بهترین محصولات بهار، نخود فرنگی رو با شما قسمت کنم. نخود فرنگی هیچ وقت جزو محبوب ترین غذاهای من نبود. هیچ وقت نخود فرنگی رو تو بشقابم کنار نمیزنم اونجور که بادمجان رو کنار میزنم، اما کلا نخود فرنگی خالی رو زیاد اهلش نیستم. محبوبترین شکلی که من نخودفرنگی رو دوست دارم توی نخود پلو هست. مخلوط با گوشت و شوید لابلای برنج به نظر من خوشمزه ترین شکلی هست که میتونین نخود رو نوش جان کنید. برنج را ۳-۴ بار با آب بشورید، بعد با ۶ پیمانه آب و ۴ قاشق مرباخوری نمک بگذارید برای ۲-۴ ساعت خیس بخورد. در یک تابه بزرگ پیاز را با روغن سرخ کنید. زردچوبه و گوشت را اضافه کنید و خوب تفت دهید تا رنگ گوشت قهوه ای شود. نخود فرنگی، رب گوجه، نمک و فلفل، و آب را مخلوط گوشت کنید و سس گوشت را به جوش بیاورید. سپس حرارت را کم کنید و در تابه را بگذارید و بگذارید تا سس برای ۱۵ دقیقه بپزد. در این مدت در یک قابلمه بزرگ ۸ پیمانه آب را جوش بیاورید. آب برنج را خالی کنید و برنج را به آب جوش اضافه کنید. بگذارید برنج کمی بپزد بعد شبت خرد شده را اضافه کنید و فوری با برنج مخلوط کنید و بعد از یک قل برنج را آبکش کنید. قابلمه را تمیز کنید و به اجاق برگردانید. ۲ تا ۳ قاشق روغن توی قابلمه بریزید تا داغ شود، سپس یکی دو کفگیر از برنج و شبت را ته قابلمه بریزید و روی آن را کمی از سس گوشت و نخود فرنگی بریزید. این کار را تکرار کنید تا همه برنج و سس توی قابلمه منتقل شوند. بگذارید برنج روی حرارت متوسط برای ۱۰ دقیقه دم بکشد، سپس شعله را کم کنید کره را روی برنج بریزید و دم کنی را روی در قابلمه قرار دهید و بگذارید تا برنج کاملا دم بکشد. حدود ۴۰ دقیقه دیگر.